And now it is all gone—like an unsubstantial pageant faded; and between us and the old English there lies a gulf of mystery which the prose of the historian will never adequately bridge. They cannot come to us, and our imagination can but feebly penetrate to them. Only among the aisles of the cathedral, only as we gaze upon their silent figures sleeping on their tombs, some faint conceptions float before us of what these men were when they were alive; and perhaps in the sound of church bells, that peculiar creation of the mediaeval age, which falls upon the ear like the echo of a vanished world. 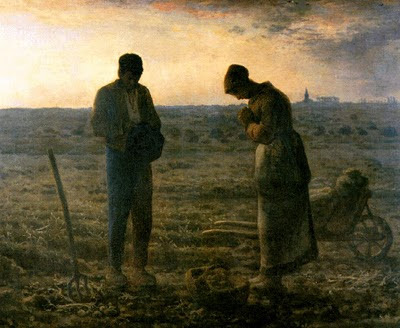 The ringing of the Angelus bell at evenfall, when the peasants were still at work in the fields, had been one of Millet's earliest impressions. Even so he had seen his father standing with bared head and cap in his hand, even so had his pious mother bowed herself and folded her hands at the sound of the evening bell, and repeated the words of the angelic salutation: "Angelus Domini nuntiavit Mariae: Ave Maria, gratia plena." It was the painter's aim to record that impression, to give the quiet peace of the evening hour, the glow of the sunset steeping the fields, the sound of the church bell borne upon the air, and the silent devotion of the peasants.